This post is named after my favorite line in a recent Discover article by Mark Changizi. He writes about how much of what we know is located in our books. He gives the example of calculus integrals: he knows how to do a lot of them. By saying he knows, he really means he knows where his book of integrals is, and he knows about where in the book different methods are located. The book has plenty of visual cues to help him pick it out among others on his bookshelf, and the pages also have visuo-spatial cues to help him find the section of interest. He refers to these facts as harnessing: because we use visual information to make our way to things in the world, using visual cues to find information like integral processes harnesses our natural instincts. 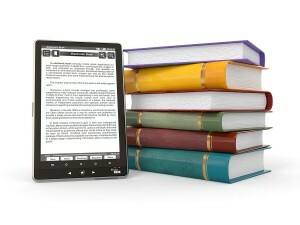 Changizi contrasts books with e-readers (and the web), which remove the navigation process. He claims that “the way we get to the information isn’t by spatially navigating our way there, but, instead, by “beaming” directly there like in Star Trek.” He wonders if this might be detrimental for our memory of the information we just beamed to. Because we’ve evolved to find things in physical space and there is no spatial component of e-info, remembering it won’t be as natural.